From Eric Morley ... This race was 10km with about 800ft of climb and run from Copley Cricket Club near Halifax. Most of the climb was in the first hill upto a lovely heather clad moor. A good beginner fell race. The race with 87 entrants was won by Rob James-Royton. From Jamie Hutchinson ... Round 3 of 4 took place from Millbeck near Keswick. Four hours of fantastic running and some walking, around and over Skiddaw. I picked up 330 points and 9th overall. 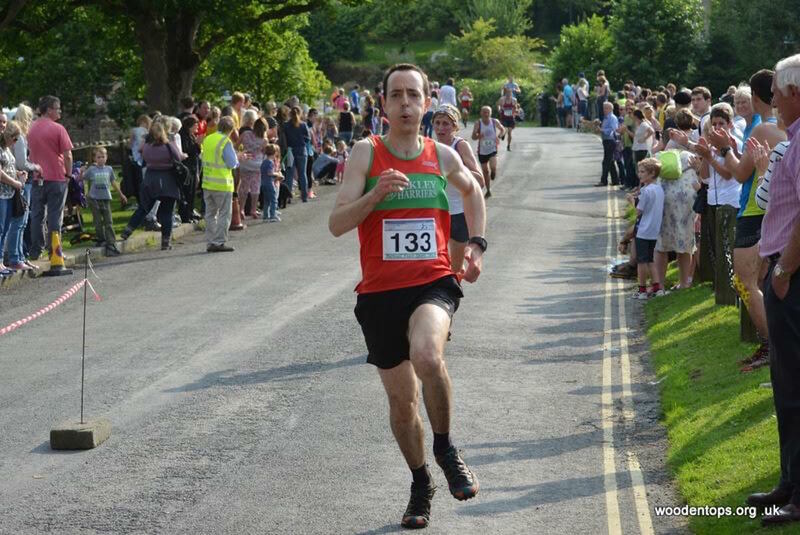 The race was won by Neil Talbott (U/A) with 415 points, 117 pairs/solos ran. From Dave Wilby ... Bit of a shock to the legs and lungs to do a guides style race again, lovely little race with a long runnable grassy climb up and round the horseshoe, before a short sharp loose rocky descent back to the finish field. 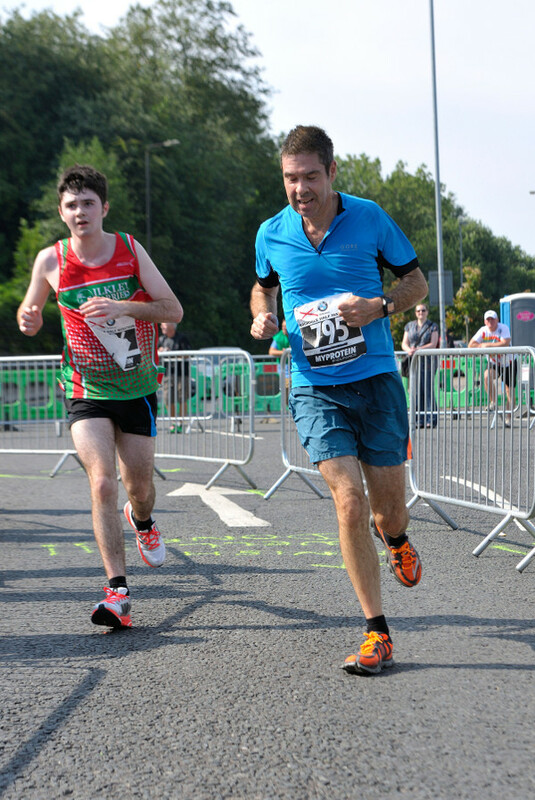 Never really got going but hung on for 5th in 27:14, behind Ben Abdelnoor who was a clear winner in 24:27. Hilda Coulsey reports ... Another great afternoon of sports and fun in Burnsall. It was hot and muggy, times were slow in the road race and less well attended this year whereas the fell race attracted a much larger group. Rob Cunningham come in first Harrier home for the 10 mile road race and Ben Shepherd in the Classic fell race. Crazy David Chandler did both. Prizes to Hilda Coulsey for 1st L50 in the road race and to Alison Weston, 1st L50 on the fell. Congratulations to all who entered. There were plenty of good junior performances too and lots of other good fun as well culminating in the fiercely contested egg throwing. All completed before the heavens opened. From Hilda ... We have queried the times given to those of us in the second half of the race, with Garmin time about 3 mins faster than Burnsall time, and according to the organiser others also reported the problem. However there isn't anything that can be done and hence, as we say on our League webpage "only official published results are used", these times will be used in the calculations. Apologies to those affected. From Jamie Hutchinson ... 9 miles and 2800ft climb. A great little race around and over Pendle Hill, very similar running to previous weekend at Sedbergh - soft underfoot with plenty of up and down. The race starts with the first and last few kms on tarmac and then three descent climbs and nicely runnable in between. I made it round in 1:43:11 and 21st overall with Nick Pearce just a few minutes behind me in 1:46:49 and 28th overall (1st V60). The race was won by Darren Kay from Calder Valley in 1:24:47, 149 ran. From Dave Wilby ... 53km/4200m It's fell running Jim, but not as we know it. Weighing in at roughly half a Bob Graham, or back to back Jura's, the first ever Glencoe Skyline race brought a world class course and event management to a small corner of Scotland under the banner of Skyrunning. The route was exceptional taking in all the major summits of Glencoe in a very natural loop, and for good measure included the graded scrambles of Curved Ridge and a full length traverse of the Aonach Eagach ridge. Nothing was roped but there were mountain guides stationed on the hill in case of any difficulties, the whole course was flagged, and there were plenty of cameramen at opportune points! All the checkpoint marshalls were issued with cowbells, and there were groups of supporters all over the place which gave the race a real European feel, and made the whole thing an amazing experience. All competitors also carried GPS trackers so the folks at home could join in the fun watching the dots all day! For my part I came into the race doubting I'd last the course, but a mixture of good pacing and the inspirational race atmosphere meant it was only in the last two hours that the wheels wobbled, loosened and then eventually fell off completely. I had a great day out and was chuffed to bits to claim 25th place out of 148 very well vetted starters, in a time of 9:11hrs. The winner was Joe Symonds in 7:36hrs but as so often this summer the ladies stole the show. Current world champ Emelie Forsberg was 2nd overall in 7:44 and Jasmin Paris was 5th overall, only 10 minutes behind Emelie despite not feeling very well at times. It looks like this will happen again next year and I don't think it will take long for it to overtake all other Skyraces as the 'one to do', so get it on your list and get training. 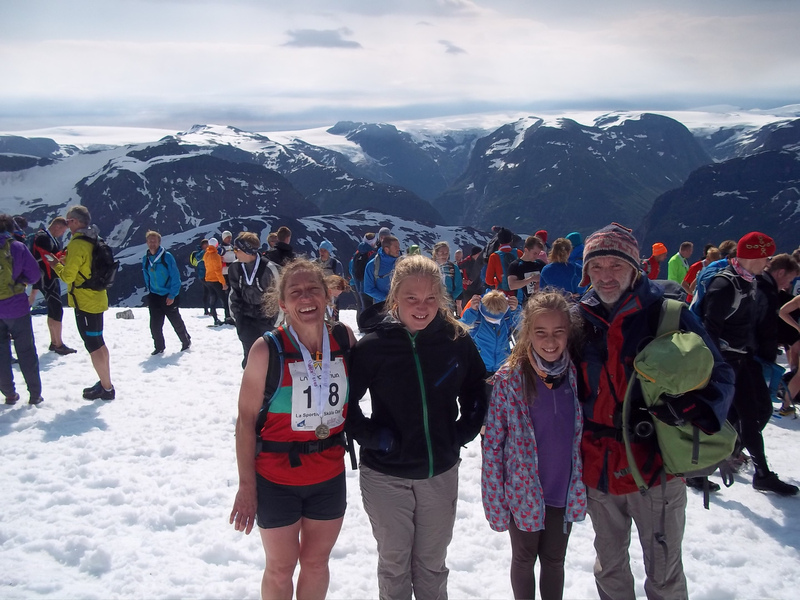 From Alison Weson ... we have just returned from almost 3 weeks in Norway and I took part in the uphill only race up mount Skala in Loen, just near the Nordfjord. It was about 1,842 m of climbing in 8.2 km from sea level. Pretty steep gradient all the way. There was no official kit list but you needed to carry a rucksack weighing at least 2.5kg at the bottom and top of the climb, with weighing scales provided at the start of the race! I struggled to get my pack to 2.5kg despite my heaviest gear and had to add plenty of food and water, despite there being 5 water stations on the way up. The route past some very impressive waterfalls and the views from the top were amazing. There was quite a bit of snow from about 1,200m and big chunks of ice on a tarn halfway up. Felt very unusual for August! Graham and the gilrs set off walking up about 3 hours ahead of me and we timed it pretty well to meet up at the top. I reached the top in 2 hours 10, a whole hour behind the winning man. Lots of photos and admiring the surronding peaks and glaciers before everyone descended at their own pace. It seemed at lot further going down though! From Jamie Hutchinson ... 14 miles and 6000ft climb. I knew this would be a toughie having done a few training runs in the area with Brian. Safe to say I made a steady start knowing what was to come. With 6000ft climb in 14 miles you can imagine there's a fair amount of walking uphill. The warm conditions with very little breeze made for a tough few hours. I felt fairly strong until the climb up to the Calf where I seemed to go backwards. Within the last few miles I realised I might be pushing it to get under 3 hours so put in a bit more effort and almost did it! I finished in 3 hours 45 seconds and 43rd overall. The race was won by Jo Symonds in 2:13:40, 121 ran. From Andrew Merrick ... given the running exploits of a number of Harriers this summer, I am not sure I am worthy to use the U word, but I can recommend this race for anyone wanting to make a small step up from marathon distance to experience something a little different. Based at a farm park in the Peak District, this was a well organised friendly event, with various presentations organised for the Friday night (together with pasta and local beer) in the barn that was the race headquarters. A longer distance (60 mile) race started at 6am on the Saturday morning with our 30 miler getting underway at 8. Pre race reccying essential, although the first and last few miles were signposted, as we headed off into beautiful but hilly Peak District countryside on a clear cool day - perfect running conditions. A useful early ultra experience of in-flight refuelling both for me and my Garmin (a USB charger does work, although you can't access distance and time info whilst charging although it does continue to record). The one large food station was sufficient as were the three serious hills. The location and relaxed nature of this event means it is one I would recommend as an ultra taster. From Brian Melia... on Saturday 8th August at 6.00 am I began a Joss Naylor Challenge. Covering some 30 tops 48 miles and 17000 feet of ascent. 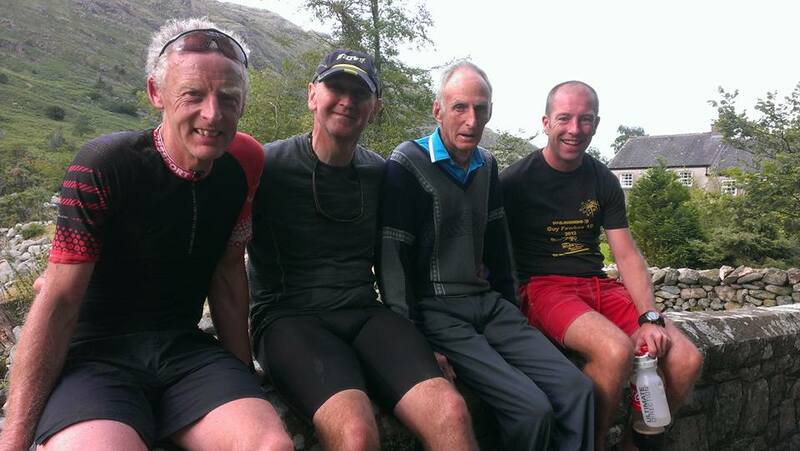 I had help from Pooley Bridge to Dunmail from Jamie Hutchison and Matt Neale. Then Dunmail to Joss's place at Greendale Bridge from Tom Phillips. I started badly falling backwards over the sign in Pooley bridge gashing my leg and stunning myself, whilst trying to explain to another runner's support that I was leaving at 6 as Jamie and Matt were still in the loo and I had to set off! I made Arthur's Pike on time at 6.35, but then i started to drop time at each top. I arrived at Kirkstone pass 9 minutes down then Dunmail raise 20 minutes down. Tom encouraged me up Steel fell and Raise, but I lost more time. It was very wet under foot and energy sapping. Things stabilised across the Sca Fell massif, but I still arrived at Styhead 40 minutes down. I asked Tom if we should stop, but he wanted at least to go up Great Gable. Without stopping for any rest, I trotted up Gable to pull back 5 minutes and this helped surge me on, taking minutes here and there. Finally, coming off Haycock up to Seatallan I was able to think about getting under 12 hours, the cut off time for my age, 51 yrs old. At Middle Fell I arrived at 17.40 with 20 minutes to get to Greendale. We ran hard off the top and happily I arrived at the finish 17.55.38secs. Jamie was not there as he expected me an hour later... he said he was snoozing!! It was a magical day and made more special with Joss waiting to have a chat. A few minutes later Wendy Dodds also arrived for the celebration - two legends!! My thanks to Tom Phillips, Jamie, and Matt Neale for their superb support. I was pleased I did not need to have another attempt as it has taken a lot out of me, which later on reflection has become apparent.